A new bookstore, Verso Books, is set to open in the Victorian regional town of Healesville. Owner Nina Sturgess said she is aiming to open the store in early November and will focus on stocking books that suit the community. ‘We have a pretty tight floor space so we will be curating the selection to suit our village. Lots of children’s, literary fiction, food and wine—obviously, being in the Yarra Valley—gardening and lifestyle,’ said Sturgess. Sturgess said she felt a new bookstore was ‘an important addition to the community and the town’. ‘The Yarra Valley has been without a bookstore for ages. There are quite a few shops selling books and a lot of secondhand books but no dedicated bookstore. After moving to Healesville seven years ago, it was something I really missed about the city—being able to while away a few hours in my favourite bookshops,’ she said. 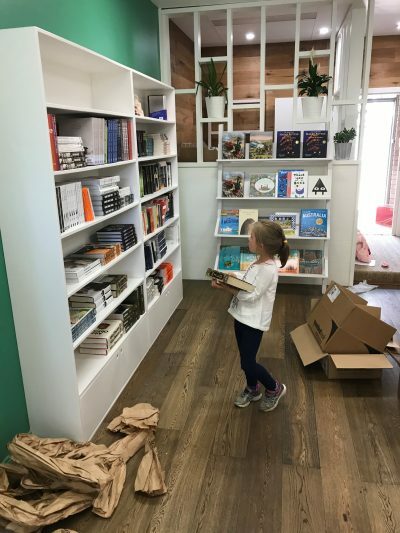 Sturgess said she was also motivated by a passion for literacy, and hopes the store will provide children in the area with greater access to books, as well as space for author events, storytelling and book clubs ‘down the track’. The store will be fitted out by Melbourne furniture designers House of Orange, with hand-painted gold lettering by illustrator Danny Wootton. Sturgess has also launched a Facebook page and Instagram account for the store. ‘I’m on an extremely steep learning curve,’ said Sturgess, who has worked in publishing and has run her own business for the past 13 years. Sturgess is the owner of Eleven Imports, a wholesale clothing, accessories and jewellery business, and plans to stock jewellery, scarves, towels, cushion covers and hats in the store, as well as Moleskine stationery, petitCollage toys, Ridley’s games and toys, and greeting cards.